Do you ever wish you could stay home and play all day like your kids? Gosh, that sounds delightful! But just like we are earning and growing through our efforts at work, kids are developing through their efforts at play. The fabulous Fred Rogers summed up this comparision perfectly: "Play is often talked about as if it were a relief from serious learning. But for children play is serious learning. Play is really the work of childhood." Let's dive into 7 facts that support Mr. Roger's quote. Just like adults cultivate talents and passions through hard work, children discover what appeals to them through exploratory play. A playful environment invites kids to figure out what they excel at, what challenges them, and what they love to do. As they build with blocks, illustrate their world, and sharpen their football toss, kids are finding sources of joy. We all need something to be passionate about. Ample play can help kids grow into ambitious adults that set goals they love. A bold, active imagination is a resource that enhances every aspect of life. Just like a muscle, creativity is strengthened and stretched through regular use. Playtime serves as a "jungle gym" where kids can exercise their inner artists, tinkerers, adventurers, and scientists. They experiment with their five senses, marvel at color, and explore cause and effect. Sure, they might be making a big mess, but with that freedom is where the magic happens! They are making connections. Basketball legend Michael Jordan once said, "Talent wins games, but teamwork and intelligence win championships." Success at work is about working well with others. It's about uniting talents and balancing weaknesses. As children play together, they are cultivating this essential skill. Play creates a safe, natural environment where they attune with non-verbal cues, learn to share, resolve conflicts, embrace diversity, and assert their own emotions. Exercise. Some of us dread it, some of us eagerly leap into it ready to sweat! Could our attitude towards fitness stem from how actively we played as kids? Possibly! Children need to move, explore, and experience the world around them. In fact, the Department of Health and Human Services recommends that kids get at least 60 minutes of physical activity each day. While playing fetch, climbing the jungle gym, and jumping rope, kids are building a foundation for a lifetime of health. All leaders were once children running amok, conjuring up games to play. All artists were once kids breaking crayons as they ventured outside of the lines. Even if play doesn't look like work, they are working on themselves! Creativity, compromise, leadership, compassion, motivation, determination - play plants the seeds for these traits. It all starts with being captain of the T-ball team! As adults, we know the price of stress and suppressing our emotions. It can be a struggle to convey how we feel in a healthy manner. Dramatic play provides children a safe space to act out emotions and learn about each other. It also relieves stress and builds mental health. They will discover what feels right and what works for them to ease frustration. Have you ever felt anxious in social situations or wonder if you'll fit in at a new job, social club, or yoga studio? 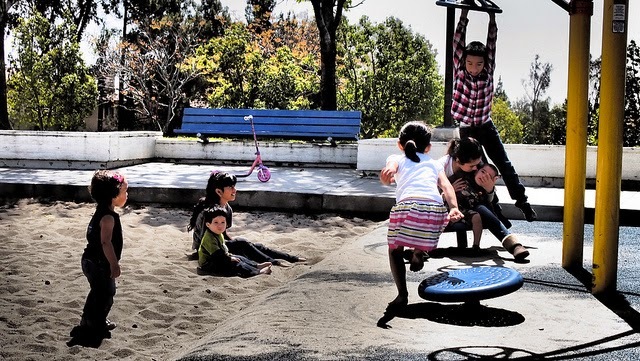 Kids sometimes feel anxiety in social arenas, too, but play can help. During a neighborhood Capture the Flag game or while preparing dolls for a tea party, kids practice social skills that help them adapt to different people and situations. Kids at play are hard at work growing into confident, well-adjusted adults. Help your kids by respecting the full value of playtime! Adults can keep growing through play too, so why not join them?